•RivEX is capable of analysing a river network on a catchment by catchment basis. A catchment is defined as all polylines flowing to a mouth node. Therefore a river network can potentially have many catchments, especially if it covers a coastal region. •Results are sent directly to MS Excel. The sequence of output fields which RivEX creates in Excel is dictated by the sequence of the highest stream order found. This is not an error and can have the effect of bunching columns together. It is simply a 'quirk' in how it stores the data. Progress can be tracked in the progress window and status bar. * = This row will expand to the largest Strahler order value achieved. •The bifurcation ratio (BR) is calculated as the number of stream segments of order X divided by the number of stream segments of order X+1. A single coastal stream polyline which has a stream order of 1 has no BR as there is no 2nd order stream to divide with. The image and table below demonstrate the BR for a simple catchment. 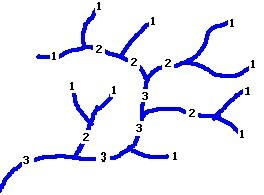 •The Strahler ordering algorithm labels both sides of a braid the same segment number if the polylines it consists of flow in a downstream direction. The bifurcation ratio is calculated from the number of segments, therefore a braid (which may physically consist of 2 or more polylines) will be considered as part of a single segment when calculating the ratio.